Snake Catcher Nathan Hawkins slid into a shallow space beneath a house in the northern part of Texas, he only brought a flashlight, a pair of snake tongs, and a smartphone with him. 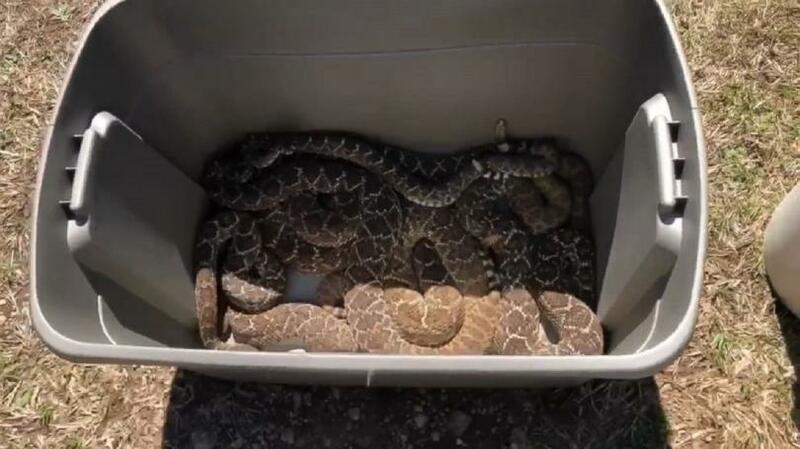 Western Diamondback Rattlesnakes could be seen all over in the video that was recorded by Nathan Hawkins, the video is around 18 minutes long. You can see the snakes crawling around. Hawkins slowly clamped down the snakes one-by-one by using his long snake tongs, you can also hear the snake rattling their tails in the video as they get dragged away. The video that was posted by Nathan showed a den of rattlesnakes hidden under the house that is located around 200 miles west of Dallas-Fort Worth Area. Snakes usually gather together in an area where they can be warm, this usually happens during winter, they then emerge in the spring season to breed and search food. As a matter of fact, there were a total of 45 Western Diamondback Rattlesnakes under the man’s house. On March 13, 2019, Nathan Hawkins showed up at the house of the Texas man by wearing jeans, T-shirt, and boots. He immediately went to work after he saw the snakes, he started to remove the snakes one-by-one. Nathan also showed his containers full of noise making rattlesnakes. Nathan added that the most number of snakes he has ever removed from a house was 88 snakes, yep you read that right, 88!! Nathan said that he relocates the snakes at ranches that are really far from livestock and people. Western Diamondback Rattlesnakes can live for more than twenty years and can also grow to six feet long. The Western Diamondback Rattlesnakes are usually found in the southwest part of America. Western Diamondback Rattlesnakes use their venom to immobilize their prey, usually, they hunt for reptiles, birds, and small mammals. The Western Diamondback Rattlesnakes is also known to bite humans, as a matter of fact, these types of Rattlesnakes bite more than any other. Nathan added that he can’t even count the number of time he has been bitten by snakes, but he said that he has been bitten 7 times by venomous snakes and all of them were not during his job. Rattlesnakes are really dangerous when they are bothered, but are “no more dangerous than humans,” said Nathan while he was laughing. Nathan added that rattlesnakes are not really the crazy ones, and are not mean like how we portray them. He added that snakes just want to be alone.